The Skype for Business product sheet provides information about product benefits, features and pricing plans. What are the main differences between Lync and Skype for Business? Do I need to have an Office365 subscription to use Skype for Business? No. 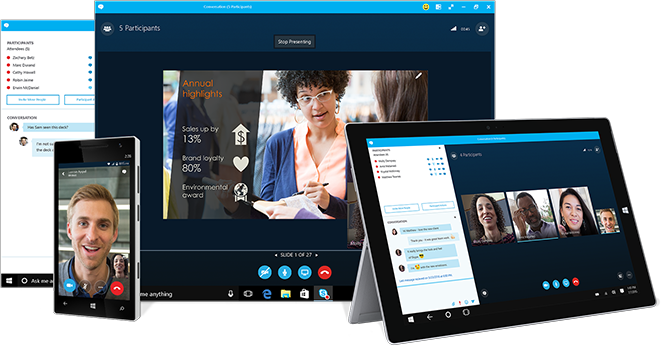 Skype for Business is available both as a standalone product and as part of Office365 Business packages. Is my Skype for Business account separate from my personal Skype account? Yes. Skype for Business credentials are separate from personal Skype credentials. Can I access my Skype for Business account through the Skype client or Skype mobile app? No. There is a separate desktop client as well as mobile app for Skype for Business. How can I prevent my Skype for Business from starting automatically every time I switch on my computer? Uncheck the box "Automatically start Skype for Business when I log on to Windows"
How do I schedule a Skype for Business meeting using my Outlook client? How do I share a PowerPoint presentation using Skype for Business? How do I use the Skype for Business Whiteboard in a meeting? Once the whiteboard opens, you can use items from the toolset on the right-hand side.